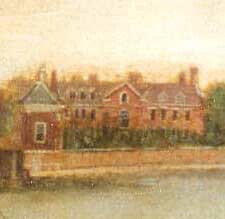 Anthony (Tracy) Keck is recorded as the owner and occupier of Richmond House in Twickenham between 1744 and 1766 (Anthony Keck Esq in the Churchwardens' Accounts). Cobbett (Memorials of Twickenham, 1872) states that he bought the property from Viscount Montague. He also acquired three adjoining cottages from Lady Torrington, the daughter-in-law of the Earl of Bradford. He was the grandson of Catherine, eldest of nine daughters of Sir Anthony Keck (1639-95). Catherine married, first, Ferdinando Tracy of Stanway House in Gloucestershire, and secondly, Edward Chute of the Vine, Hampshire. By her first marriage she had two sons, John and Anthony. 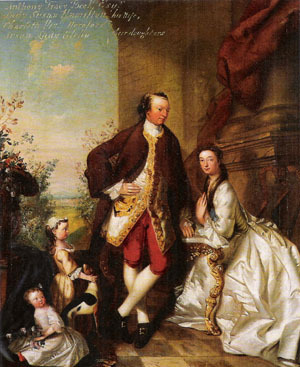 John married Ann, daughter of Sir Robert Atkyns, Baron of the Exchequer. They had 4 sons: Ferdinando, Anthony, Thomas and William, and 5 daughters. In 1729 Anthony took the name of Keck, his grandmother's maiden name by a condition in the will of his great-uncle Francis Keck, which enabled him to inherit the manor of Great Tew, Oxfordshire. He married Lady Susanna (Susan) Hamilton (1706-55), 7th child of the 4th Duke of Hamilton & 1st Duke of Brandon on 3 August 1736 and there were two daughters of the union, Charlotte and Susan. An Ann Keck, daughter of Ann, who was baptised at St Mary's Church on 11 January 1745 may have been a family member, but has not been traced. Lady Susan was an energetic and prominent political manager of the time. Although he was elected MP for New Woodstock in 1754 through the influence of the Duke of Marlborough, his interest was in horse racing rather than politics and it cost him a lot of money. He was, according to Jackson's Oxford Journal, "A Gentleman universally admired for the ingenuous openness of his disposition, engaging Affability, and peculier Integrity towards his Friends." He died of happiness (apoplexy) at Epsom Races in 1767 when his horse won its heat. Little is known about his life in Twickenham although he apparently came to the attention of the Manor Court in 1751 (London Metropolitan Archives,ACC1379/43, pp143 & 188). On 2 October that year it was reported at a Court Baron that he had encroached on public land by the erection of a new wall beyond the old foundation and had erected a building on part of the footpath next to the Thames. At the same Court it was reported that he had trespassed by “lopping several elm trees on waste ground of the Manor near his dwelling house”. There is no further word of this matter in the manorial records. Many Kecks were drawn to the law: eleven admissions to the Middle and Inner Temple alone are recorded between 1650 and 1720. Anthony was a popular Christian name, probably used as a tribute to the first recorded Anthony. Sir Anthony Keck, barrister of the Inner Temple, of Great Tew and, later, Blunsdon in Wiltshire enjoyed a distinguished career in the previous century. He was knighted in 1689 by William III and made one of three Commissioners of the Great Seal. He was the fifth son of Nicholas and Margaret, living variously at Mickleton, Glos; Swalecliffe, Oxon; and Broom Court, Warks. He married Mary, daughter of Francis Thorne. A son, also Anthony is recorded as buried “in ye round” (that is, the Temple Church) on 18 May 1688.This may have been the son recorded as baptised on 2 March 1683 at St Olave, Old Jewry. His will of 2 May 1696 (PCC Prob11/433) describes him as of St Dunstan's in the West. He left one son, Francis (1660-1728), born at Great Tew, as well as the nine daughters. Thomas, an older brother of Sir Anthony was admitted to the Inner Temple on 11 November 1651 having previously been admitted to Gray's Inn in 1641. He became a Master of the Bench of the Middle Temple in 1669, dying in 1671. Samuel, his eldest son was also admitted, becoming, in 1669 a Master in Chancery. Dying in 1725 he was buried in the Temple Church. Four other sons of Thomas: Nicholas, Morris, Anthony and John were admitted to the Middle Temple, though none were actually called to the Bar. An Anthony Keck (1726-97) practised as an architect in Gloucestershire and surrounding counties during the 18th century. He was born either at Great Tew, or at Mickleton, suggesting that he was of the same family. He was buried at St George's Church, Kings Stanley, Gloucestershire where there is a plaque recording this. According to George Vertue, writing in 1719, a “Mr Keck of the Temple” had owned the Chandos portrait of William Shakespeare, having bought it from a Mr Betterton for 40 guineas. This was Robert Keck (?1686-1719), FRS whose admission to the Inner Temple is recorded for 1701. 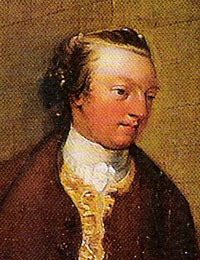 His father, yet another Anthony (1660-1714) was a son of Nicholas who was, possibly, an older brother of Sir Anthony Keck. When Robert died in 1719 the picture came into the possession of his cousin Francis of Great Tew, Sir Anthony's son. Francis died in 1728 and his son John inherited. John died the following year and his widow kept the picture. She then married again, within the family, John Nicoll the son of Winifred Nicoll (nee Keck), Sir Anthony's eighth daughter. Their daughter, Margaret (1734-68), married James Brydges(1731-89), Marquess of Carnarvon and 3rd Duke of Chandos. So, the picture, like the widow, migrated within the extensive family by inheritance and this would explain how it acquired its name. The portrait was presented to the National Portrait Gallery in 1856, the year of the founding of the gallery. Anthony Keck, Sergeant at Law of Cheshunt, Hertfordshire, 4 Mar 1786, Prob11/1140.